and just because he's so cute. I think he'll like the chicks too. The chicks pictured are spoken for, but there are more on the way, so I do have a few weeks to decide. Chickens are great. They are a fun "chore" for the kids to learn responsibility with. Be sure to get a coop and keep them in a sectioned-off area of your yard, "free-ranging" chickens will leave chicken poo all over the place. If that sort of thing doesn't bother you, then no worries! The poo gets all over and is stinky... sometimes they peck. But, if all those are to your liking... go for it. A good book is Storey's Guide to Raising Chickens. We've had chickens for a year now, and love getting fresh eggs. We love chickens, just to buy to many or you will have eggs for every meal. 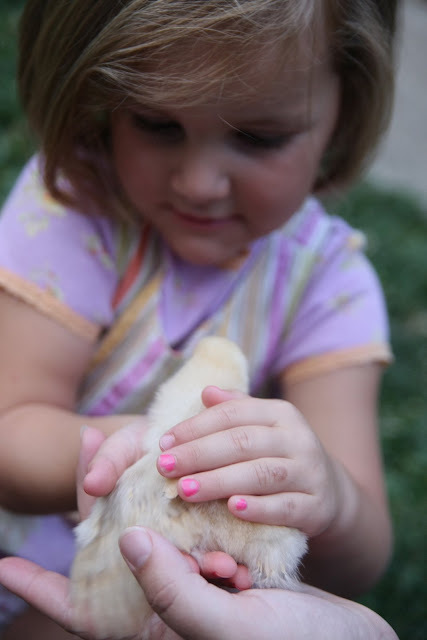 I grew up with chickens and I loved it. Each spring a giant cardboard box full of baby chicks would arrive. I was always fascinated by the delivery. Who knew live animals could be "shipped"? They were so cute and tiny, but a little stinky. It was fun to watch them grow and great to have fresh eggs. We also had so much fun picking out different varieties that would lay colorful eggs. This is where we ordered from http://www.mcmurrayhatchery.com/ Good luck! We took the plunge for Easter, and are in LOVE with our chickens! Our coop cost alot, but it looks like a custom made playhouse, and is incredibly cute and so easy to clean. Our chickens think we are their mothers, so they follow us around the yard eating bugs and weeds. They never peck and just play with us and give eggs, so perfect! Easier than cats, and even goldfish. Just a thought, see if you can get a guarantee that they are hens. If one turns out to be a rooster you can exchange it. 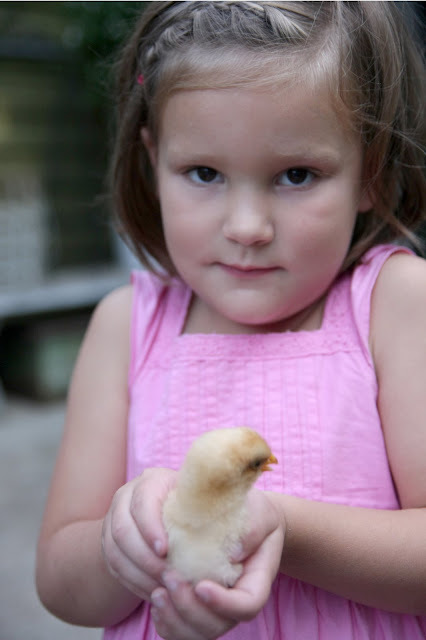 Also, bringing in a chick to a group of older chickens can be tricky. I got alot of great info on line at backyardchickens.com. Hope you enjoy them! p.s. 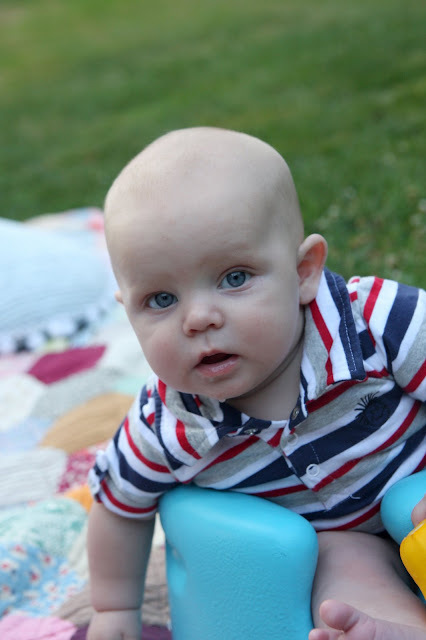 as always adorable pics of the kiddos. Don't know how your new landlord would feel about chickens??? i totally want chickens. it isn't in our zoning, though, and since my husband is a city planner, he's not comfortable breaking the code. the city council almost changed the code recently, until a bunch of old people complained. i am so sad. 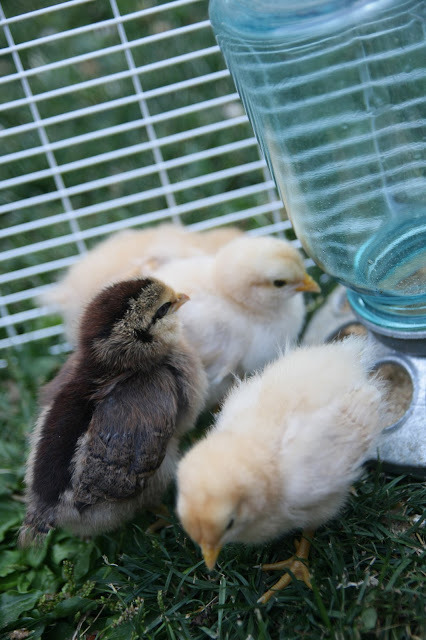 I love the sweet little peeping noises baby chicks make!